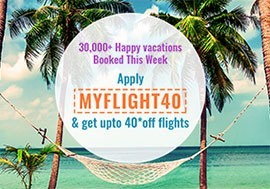 Offer of the Day: Apply promo code MYFLIGHT40 & get up to $40 off flights. Be a part of over 200,000 wanderlusts to get exciting travel stories, tips & hacks and members only discounts and coupon code! Join Now! Exploring the world as a backpacker can be exciting as it gives you the opportunity to discover the less-explored destinations. Backpacking can create memories that will last you a lifetime. You must, however, plan your vacation well in advance to take the load off your credit card. A majority of travel enthusiasts have backpacking on their bucket list but heading off without a plan in place is not a great idea. So here are some easy and useful tips that you can follow to make your journey stress-free, budget-friendly, and full of fun. Think smart and travel light and this will make your life simpler and less cumbersome. The best way to avoid overpacking is by choosing a smaller bag. This will reduce the chances of you adding extra stuff and help you prioritize things. Keep track of all the essential items that you use a few days before you start with your vacation. While packing your essentials, check the list that you have made for your travel plan and figure out the things you need. Do not forget to bring along medication, toiletries, swim trunks, passports, and other relevant documents while you are packing your travel gear. Renting expensive items like backpacking tent, pad, and sleeping bag can help you save money as these items can be expensive to purchase. Personal items such as clothing, footwear, and gadgets that require a minimum amount of space can be kept in compact and lightweight compartments. Keep some spare time for self -rejuvenation! Try being as flexible with your plan as possible and go with the flow. Keep some free time in your itinerary so that you can rest, rejuvenate and enjoy your expedition by indulging in whatever activities you like without any stress. Water resistant shoes are always a good idea if you will be spending time in the outdoors. You will be able to navigate through varying temperatures and weather conditions if you opt for sturdy and durable shoes. Also don’t forget to pack a pair of gloves, a hat, a lightweight pullover, and a thick vest. A waterproof jacket and rain pants will come handy during a downpour. Try to carry along packaged instant noodles for dinner, and protein-rich candy bars for lunch as they will help you maintain your energy levels while you are on the move. Consider going on pre-trip hikes with your backpack already loaded as this will help you get in shape for the trip, and you will be able to get used to the feel of the equipment. Learning the basics of first aid and compass navigation are a great way to help ensure a safe trip. Make your arrangements ahead of your time! Avoid packing at the last minute. Also, pick and choose some all-purpose favorite clothes with a simple color palette that would enable you to easily mix-and-match your attire for the entire trip. Keep some portion of your bag empty as well, as this will help you be able to find particular items easily. The extra space can later be used for any souvenirs you bring back. So start preparing for your next venture and get rolling! Taking The Road Less Traveled with Emirates airlines. Is Detroit Hip Hop Scene worth Booking a Cheap . Please enter a valid email address / user name Please enter a valid password. Incorrect Security Code Incorrect user name / password. Full Name Require. Email Address Require. Email Address Not Valid. Mobile no Require. Mobile no must be 10 numbers. Password Require. Confirm Password Require. Password must be 8-15 characters. Password must include at least one uppercase letter. Password must include at least one lowercase letter. Password must include at least one numeral. Password must include at least one special symbol: ( ) _ . # $ % & ' " *+ - = > ? @ Passwords do not match. Please re-enter passwords. User created successfully. User Already Registered. Please enter a valid email address This email is not registered. Please enter a registered email address. Email ID verified Successfully. Please enter OTP sent in your registered email ID. Pleae enter valid OTP. OTP is valid for 30 Minutes. OTP has been resent on your email. Password must be 8-15 characters. Password must include at least one uppercase letter. Password must include at least one lowercase letter. Password must include at least one numeral. Password must include at least one special symbol: ( ) _ . # $ % & ' " *+ - = > ? @ Passwords do not match. Please re-enter passwords. Recent password can not be used. Your password has been reset successfully. You can now log into your account.